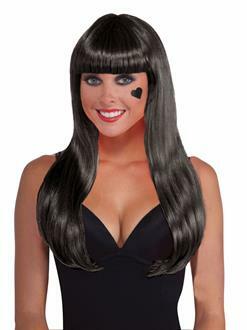 Create your perfect secret agent or even witch costume with this elegant Long Black Wig Accessory! This fun and comfortable costume headpiece is made of high-quality materials for a fit you will love to wear this Halloween and for any other costumed occasion year round! Give any outfit a sleek new vibe with this awesome costume wig! Check out all of our costume accessories! Don't wait! Order yours today!